There’s a huge sci-fi inspired concept running as a theme to this album, the description of which could take all the space I have available. Without hearing a note that leaves me a little concerned as progressive and concept, two words that seem to go tgether very easily, are sometimes uncomfortable bed fellows. Opener “Inceptus" starts big and vaguely epic, a real space feel to the drawn out riffs with supporting crashing rhythms and then risks going a little odd. The ideas come in waves and the instruments start becoming just a little too independent of each other. That feeling doesn’t really dissipate as the songs continue. There’s too much emphasis on outlandish keyboard solos for a start and they begin to become irritating. Two short wild instrumentals and they have more or less lost my attention. 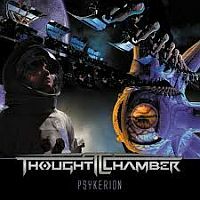 Vocals do finally appear on “Psykerion The Question" and they are welcome and indeed well delivered but it still sounds like there are about six songs going on. The parts aren’t regularly layered enough for me. What follows is a generally hit or miss affair. “In The Words Of Avakus" is a cool mellow track, most of the vocal led songs are good if occasionally disjointed, but the instrumentals just disappear in their own quirky brilliance. You can’t deny the musicians’ skills but they shouldn’t all try to show it at once. For out and out proggers this is a must have. The jazz infused odd stuff is as good as it gets but being a bigger fan of slightly straighter progressive metal this tips over the edges too often for me. Songs like “Kerakryps" are much more up my street and the weird noises and multi instrument diversions just get in the way of the fuller songs.